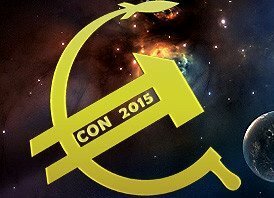 The Russian city of St. Petersburg will host Eurocon 2015. Since this was decided last year the committee has picked the dates – April 23-26 – but is still researching a venue. They want one near the city center, rather than on the outskirts of town where big sf conventions have been held in the past. I asked about the logo, and learned it is more subtle than I thought. The hammer-and-sickle is flipped from its usual orientation and, as Chris O’Shea explained, incorporates the Euro currency symbol (€). My guess is that the rocket ship at the upper tip of the Euro symbol is also an homage to the Gagarin [Conquerors of Space] memorial sculpture in Moscow. I undetstand the auditoriums may have trouble with raked seating. If your point of view is blocked, and u-kraine, your neck, it may be troubling.